Pro Display has been involved in the design and development of full colour LED displays since the technology evolved in the late 1980’s. Our engineers have vast experience in the industry having developed all kinds for LED solutions including message boards, graphic panels, time / temperature displays, scoreboard modules, full colour video screens and even LED light sculptures. Over the years we have installed thousands of LED displays into numerous industries – shops, shopping centres, corporate offices, factories, call centres, government buildings, transport links, stadiums and arenas. MAJESTIC 6mm LED Screen offers one of the finest, sharp and crisp images in the industry. It is easy to rig and stack and its plug and play processing control simplifies even the trickiest of installations. Available for hire, the 6mm is an impressive LED solution and is suitable for indoor and outdoor use. 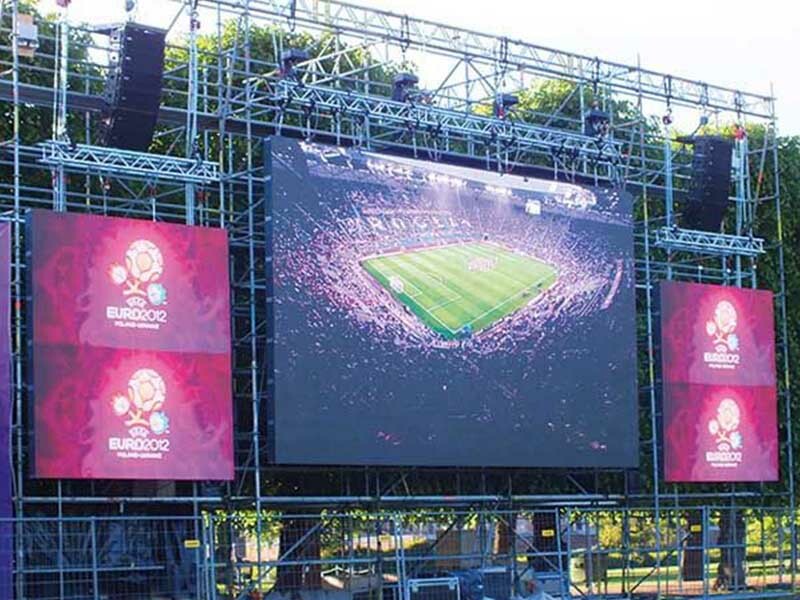 MAJESTIC Outdoor LED display screens available for hire, the 6mm is an impressive LED solution and is suitable for indoor and outdoor use. MAJESTIC Outdoor LED display can be disassembled and assembled from the front by special tools. Our product with quick-clamp locks is quite slim, lightweight, thus being easily carried and installed. By a low consumption heating system, it has good heat dissipation through the natural air convection. Its main structure is manufactured from aluminum with high heat transfer coefficients. With high efficiency, the heat from power supply units will be conducted into the air. Therefore, there are no additional cooling fans required. With the adoption of MBI 5035 Driver IC, this series provides high refresh rate and low power consumption. There is a quite small seam between two adjacent cabinets. MAJESTIC Outdoor LED Screen is equipped with power supply units without fans. As a result, no noise will be generated while running. The whole production process is significantly simplified, therefore greatly decreasing the costs. Our Outdoor LED Display is IP65 rated both front and back panel. The improvement of cable connection between LED panels has greatly minimized the use of extension cables. LED Display Rentals is provided by our company Majestic Audio Visuals. We are pleased to introduce ourselves as the most preferred provider of LED Display Rentals. As a leader in this field – our LED Screens are affordable and best quality. We are also a one of the leading exporters of LED Display Rentals from India. Majestic Audio Visuals has been experienced provider of LED Display Rentals since 1970. We provide all kind of Audio Visual Equipments and LED Display Rentalswith best quality and as per client requirement.